That's it from the Siambr for today. Tomorrow morning Senedd Live will broadcast the Children, Young People and Education Committee. A summary of business can be found in the Votes and proceedings section of the Record of Proceedings. David Rowlands says UKIP "fully supports and applauds the Welsh Government's strategies on recycling, and acknowledges the outstanding progress made so far". As the public seem so supportive of recycling, he says the Welsh Government should now "concentrate on the companies that produce much of the non-recyclable waste". Conservative David Melding draws attention to the "significant impact that a bottle deposit return scheme could have in helping to hit Wales's recycling targets". Plaid Cymru's Simon Thomas calls for greater ambition from the Welsh Government by setting "a target of achieving zero waste by 2030," and he cites Ceredigion Council as an example of a strongly-performing council on recycling. He draws attention to the budget agreement between the Welsh Government and Plaid Cymru to further increase recycling rates through piloting a deposit-return scheme. He calls on AMs to support the proposal to decrease residual waste levels through introducing a tax on non-reusable and non-recyclable plastics. The final debate of the day is on the 'circular economy'. Environment Secretary Lesley Griffiths says Wales in now the "UK's leading nation in municipal recycling and third nation in the world". b) a 50% reduction target for food waste. Her predecessor Carl Sargeant often claimed Wales was the Real Madrid of recycling. Labour AM for Newport East, John Griffiths says racial tensions have worsened in recent months and years. UKIP's Neil Hamilton says he was once a victim of hate crime when he had his nose broken when he went to the aid of a gay friend who was being "attacked by homophobic thugs"
He says his party supports the Welsh Government's Tackling Hate Crime Framework. 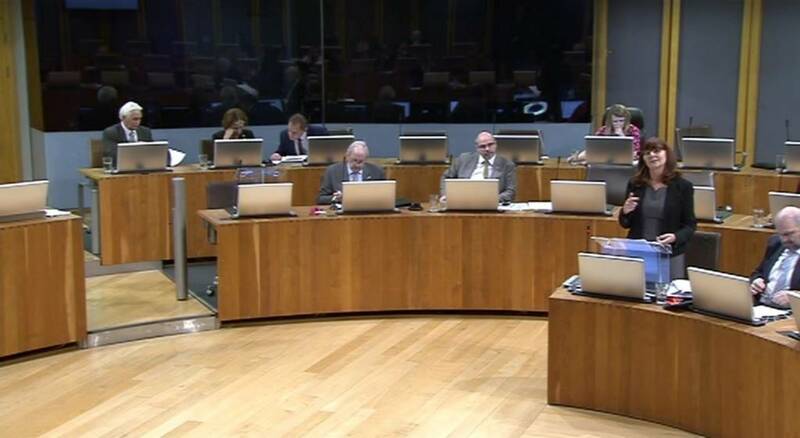 Bethan Jenkins acknowledges Plaid Cymru's first amendment - calling on the Welsh Government to "tackle the radicalisation of white men into far-right groups and noting recent terrorist activity committed by the far right" - "could be more nuanced". She calls on the Welsh Government to provide more victim support officers and to "introduce teacher training on how to deal with hate-related incidents in schools, and to take action to prevent schools keeping this hidden". Plaid Cymru also calls on the Welsh Government to "improve community cohesion following terrorist incidents as this is when hate crime against Muslims tends to rise". Conservative Mark Isherwood says "although there has been a steady increase in the overall recording of hate crime, the charity Victim Support has said that more needs to be done to encourage victims to come forward". He welcomes the UK Government's new social media code of practice that will "ensure a joined-up approach to remove or address bullying, intimidating or humiliating online content"
He calls for crimes committed against older people because of their age to be recognised as hate crimes., and on the Welsh Government to add hate crime to the refreshed Autism Strategy. The first debate of the day is on tackling hate crime. The Welsh Government's Tackling Hate Crime Framework was published in May 2014. After the Brexit vote, there was a spike in race hate crimes in England and Wales. Figures published last month showed the number of LGBT people who have experienced a hate crime in Wales has risen by 82% in four years. Members agree that provisions in the Telecommunications Infrastructure (Relief from Non-Domestic Rates) Bill, relating to non-domestic rates relief, insofar as they fall within the legislative competence of the National Assembly for Wales, should be considered by the UK Parliament. The UK Government’s stated policy objective is to support investment in new fibre broadband infrastructure and future 5G communications through the provision of a new 100% non-domestic rates relief for new full-fibre infrastructure. This relief will be provided for a five-year period from 1 April 2017. The relief can be backdated to 1 April 2017 for eligible infrastructure. UKIP's Michelle Brown welcomes the recommendations from Qualifications Wales but says they "only deal with the symptoms of an underlying illness in the Welsh education system, not the root cause which is a lack of vision sadly matched by a lack of analysis and planning by the Welsh Government". Voice of young people heard? Plaid Cymru's Llyr Gruffydd welcomes the proposals, but questions whether the voice of young people - the ones who will actually be affected by the changes - was heard in the review by Qualifications Wales. Conservative Paul Davies welcomes the two main changes but questions "why it's taken so long to get to this point when the problems have been apparent for years?" Education Secretary Kirsty Williams announces new rules so "interests of pupils are always put first". This follows recommended changes from Qualifications Wales, which said it believed "widespread use of early entry poses a significant risk to learners". How Welsh Government school performance measures are calculated, so that only the first grade awarded to a pupil counts towards performance measures. Currently, schools can count the best grade by a pupil from multiple sittings. A lift on the restriction on English language and Welsh language GCSEs that only allows students who are re-sitting to be entered for exams in November. The regulator believes this will mean early entries are more likely to be in the best interests of the pupil and will also limit time spent in preparing for repeat exams. It has also estimated that schools spent more than £3.3m during the 2016-17 academic year on early entry. The next statement is by the Cabinet Secretary for Education Kirsty Williams: Update on GCSE Early Entry. There were more than 43,000 early entries at GCSE last summer - half way into courses designed for two years. Early entry was flagged as the main reason for the slide in Wales' overall GCSE results this summer to the lowest level for a decade looking at A* to C.
Nearly a fifth of entries in English language, Welsh and maths exams in the summer were from pupils from year 10. Schools under pressure over performance was a factor to explain the growing practice, a 10-month review by Qualifications Wales found. UKIP's Gareth Bennett says "I haven't read all of the explanatory memorandum either, in fact to be honest I haven't actually started it"
Conservative David Melding and Plaid Cymru's Bethan Jenkins are minded to support the general principles of the bill, with the caveat that the details will be scrutinised at committee stage.